A big yellow sign that reads "Caution! Do Not Enter!" What can this mean in a hospital setting? At Lady of the Sea General Hospital, it means that we meet and exceed the strictest of guidelines when it comes to our hospital laboratory facility and the tests performed there. The big yellow sign helps in deterring non-lab personnel and patients from entering the lab area. Some lab processes must be performed in a controlled environment and we take pride in the fact that our lab is accredited by COLA, an independent accrediting organization whose practical, educational standards have a positive and immediate impact on organizations. By participating in the COLA accreditation program, our laboratory and staff meet all Clinical Laboratory Improvement Amendments (CLIA) issued through the FDA under the Department of Health and Human Services as well as other regulatory requirements, act in accordance with Quality Systems and provide the best possible patient care. Although some patients may come to visit a Phlebotomist at the lab draw room at our hospital, many patients never see the lab area although their medical care depends on the results that are processed at the lab. 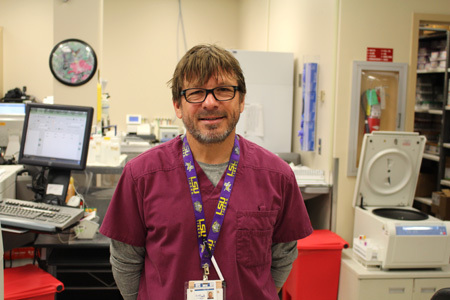 Patients on the Med / Surg floor or ER patients have clinical specimens collected at the bedside, while many patients have lab specimens collected at any of our family medical clinics located throughout South Lafourche. All of the specimens come back to Lady of the Sea and the majority of it is processed on-site in our laboratory. A medical test conducted on a small sample collected from your body can give your doctor information that can help save or improve the quality of your life. As health care consumers have been given more responsibility for their care, more attention has been given to the value of preventive medicine. Many illnesses or chronic diseases are controlled with medications and lifestyle changes that are tracked and adjusted through regular blood work drawn from patients. These lab draws provide the physician and the patient with a constant measurement of their health and future wellness. One of the most important factors in determining the accuracy and reliability of your laboratory test is you, the patient. Some tests require fasting prior to the specimen being drawn, while others require a full rundown of what a patient has eaten and been in contact with in the near past. A patient should take all lab tests seriously and comply with their physician's orders. 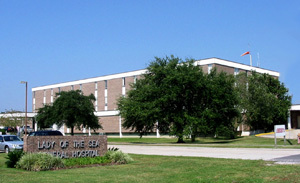 Here at Lady of the Sea General Hospital, all of our patients are important to us. We strive to provide the most advanced health care available in a facility that not only meets today's standards, but exceeds them. You can trust that our lab processes and results will offer you and your physician the most accurate, timely information to assist in your continued healthcare. For information on the Blood Donor Center, click here.